Authentic Italian Osso Bucco: veal shanks slowly braised with vegetables in tomato sauce and white wine until the meat falls of the bone. Topped with another Italian classic: Gremolata (a condiment made with parsley, lemon zest, and garlic). The veal shanks are served over creamy polenta or saffron risotto (Risotto Alla Milanese). Osso Buco always sounded to me like something very difficult to make. That is until I made it. In reality, it is quite easy to make, and is one of the best recipes you can make with veal shanks. In this recipe Osso Buco is a one pot meal – with everything cooked in one large skillet on stove top. No need to use multiple pans or turn on the oven. Just place all the ingredients in one skillet and let the Osso Bucco simmer for 2 hours until the meat falls of the bone. 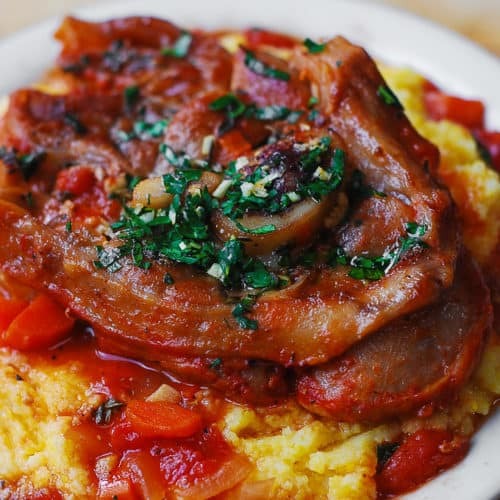 Osso Buco is a classic Italian dish made with veal shanks, braised in white wine, tomato sauce, and broth flavored with vegetables. It is traditionally garnished with Gremolata (chopped parsley, lemon zest, and minced garlic). This Italian main course is usually served with saffron risotto (Risotto Alla Milanese) or polenta. 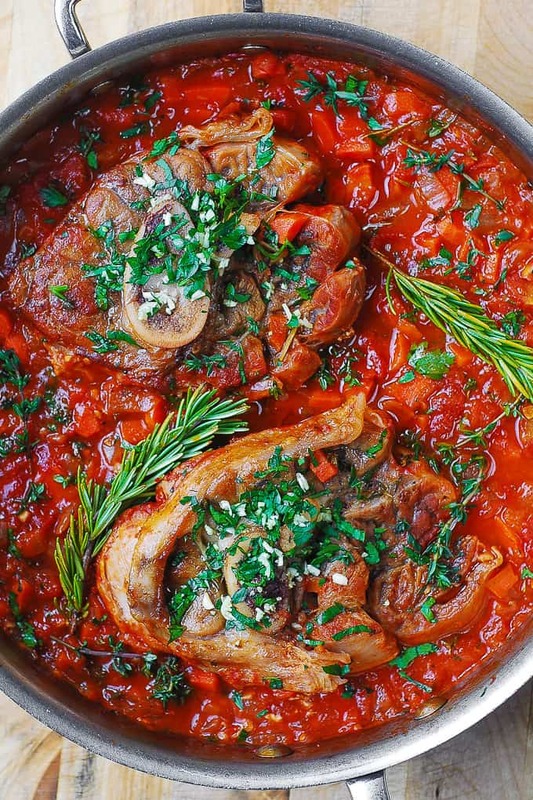 If you don’t have veal shanks, Osso Buco can also be made with lamb shanks or pork shanks. 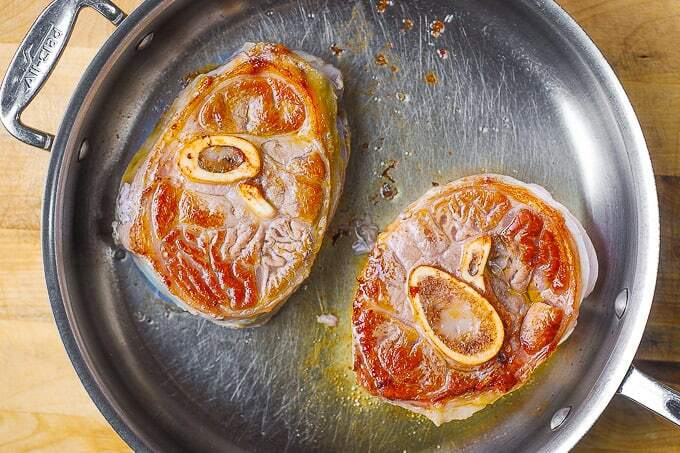 First, brown veal shanks, seasoned with salt, in olive oil on high heat in a large skillet. Cook the veal for about 2 minutes total on high heat, on both sides, until nicely browned. Next, remove browned veal shanks to a plate, and to the same skillet add diced onion, carrots, garlic. Saute on medium heat briefly. 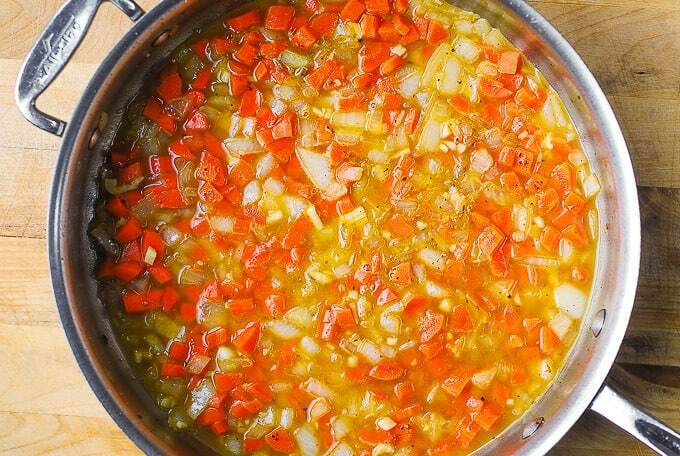 Add white wine and water, add 2 chicken bouillon cubes, mix everything on high heat until chicken bouillon cubes dissolve. Add diced tomatoes, tomato paste, stir in. Add fresh herbs. Return veal shanks to the skillet. Cooking Tip: If you like, at this point you can use a kitchen string to tie around each veal shank which will help to hold it together during the 2 hour cooking time. However, using the kitchen string is optional. 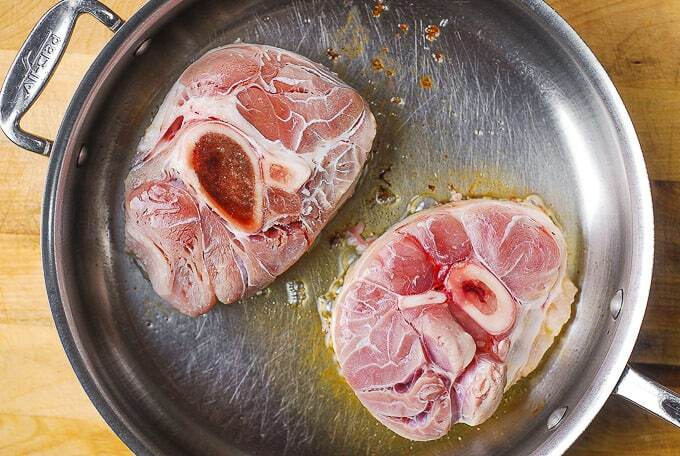 Make sure that the veal shanks touch the bottom of the skillet and are surrounded by the sauce. Cover with lid. Simmer for 2 hours, occasionally checking to make sure the heat is low enough and that the liquid does not evaporate too much and to check on the softness of veal. Gremolata is an Italian condiment usually made of only 3 ingredients: fresh parsley, garlic, and lemon zest. It is traditionally served with Osso Buco. It also goes well with lamb shanks and all kinds of grilled meats, such as beef, pork, and chicken. To make simple gremolata, combine 1/2 cup minced fresh parsley with 4 garlic cloves (minced), and 2 tablespoons of lemon zest. Stir everything in the bowl. Barolo is a red wine from Piedmont region of Italy. It is rich and full bodied, with a strong acidity and tannins. Perfect for Osso Buco! Brunello, a Tuscan full-bodied wine, pairs great with Osso Bucco. California wines, such as bigger and bolder Zinfandel and Pinot Noir. 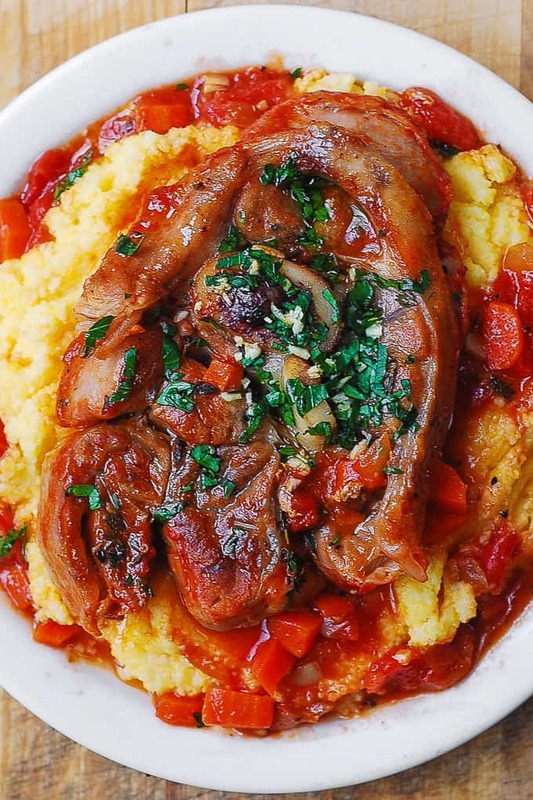 What is Osso Buco served with? Risotto Alla Milanese (saffron risotto) is the classic side dish for braised veal shanks. Creamy polenta is another excellent choice. It’s easy to make: first cook polenta in water, then mix with butter, or heavy cream or both! Mashed potatoes are easy to make, and they pair beautifully with braised veal shanks! Cauliflower “mashed potatoes” are made with pureed cauliflower instead of actual potatoes. 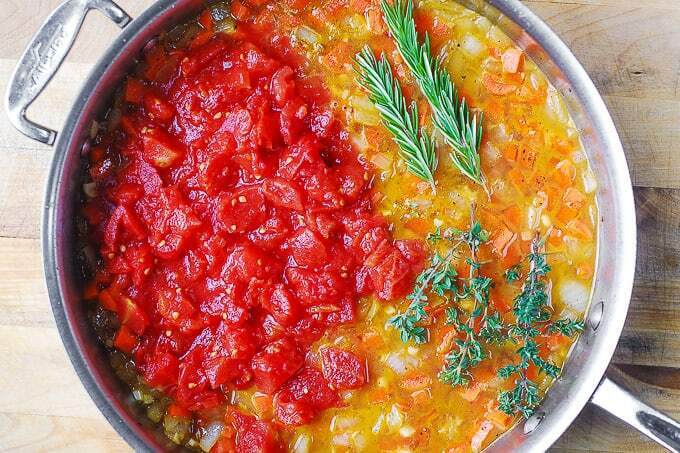 A healthier side dish for Osso Buco. You can also serve mushoom risotto or butternut squash puree as side dishes. 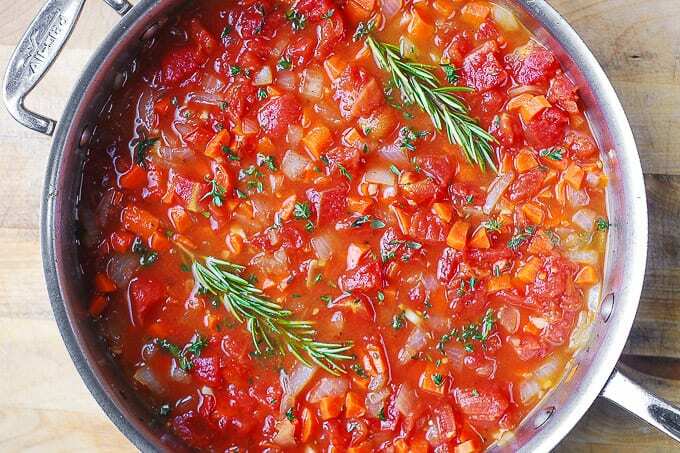 Classic Italian Osso Buco recipe - stew made with veal shanks cooked in tomato sauce and white wine. Osso Buco is traditionally topped with Gremolata - an easy-to-make condiment made with parsley, lemon zest, and garlic. Serve these veal shanks over creamy polenta or saffron risotto (Risotto Alla Milanese). Season osso buco (veal shanks) with salt. Heat olive oil in a large skillet. Add the veal shanks and cook for about 2 minutes total on high heat, turning once, until golden-browned. Remove the veal to a plate. 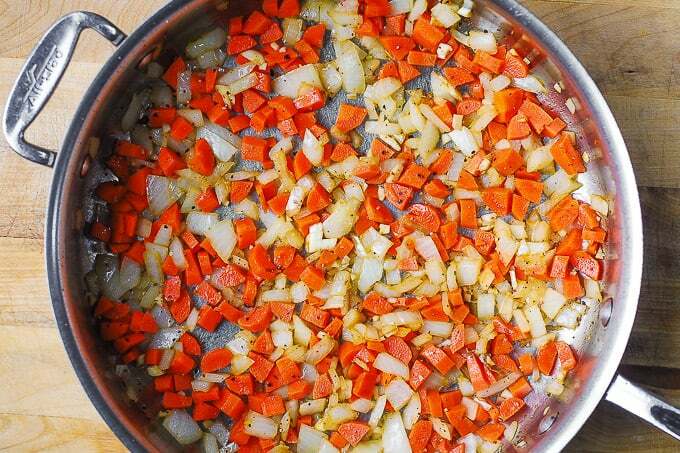 To the same skillet add diced onion, carrots, garlic. Saute on medium heat briefly. Add white wine and water, add chicken bullion cubes, mix everything on high heat until chicken bullion cubes dissolve. Add diced tomatoes, tomato paste, stir in. Add fresh thyme and stir in. Return veal shanks to the skillet. Note: If you like, at this point you can use a kitchen string to tie around each veal shank which will help to hold it together during the 2 hour cooking time. However, using the kitchen string is optional. Make sure the veal shanks sink in the sauce and touch the bottom of the skillet, with the sauce rising to the sides of each veal shank. 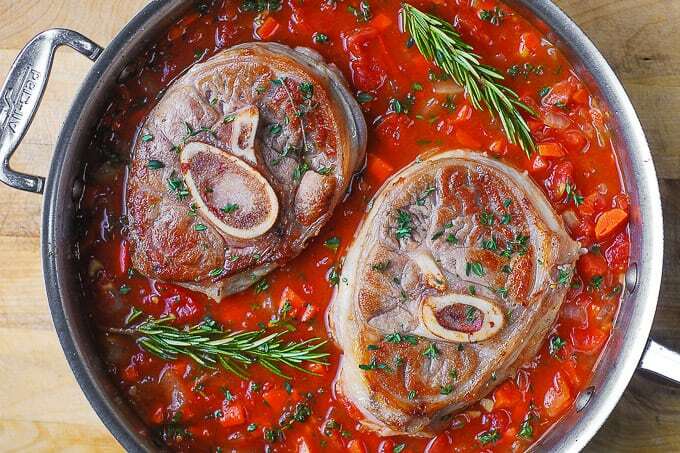 Place 2 large whole sprigs of rosemary around Osso Buco veal, and sink them in the sauce. You will later remove them so keep them whole. Cover with lid. Simmer for 2 hours, occasionally checking to make sure the heat is low enough and that the liquid does not evaporate too much and to check on the softness of the veal. In the end, the liquid should be reduced. If not, increase heat until the sauce reduces and thickens. Season with salt if needed. Top veal with chopped parsley and garlic.